WASHINGTON (AP) — Still reeling from a devastating defeat in last week's election, Democrats are beginning the process of charting the direction of their party in the Donald Trump era. With Hillary Clinton and her team staying out of the public eye, liberal politicians have begun jockeying for control of the party's future. While they all backed Clinton, they're now pushing for a serious shift in the party's policy positions, financial resources and grassroots organizing to focus more on holding a progressive coalition together at the same time as they work to win back the white working class voters who went for Trump. "We have to do a lot of rethinking," said Vermont Sen. Bernie Sanders, who mounted a fierce challenge to Clinton in the primary. "Democrats are focused too much with a liberal elite, which is raising incredible sums of money from wealthy people," Sanders said on CBS's "Face the Nation." The Democratic National Committee, the last bastion of party power in Washington, is quickly emerging as ground zero for the fight. After losing both the White House and Congress to Republicans— and fearing the impact on the Supreme Court — the Democrats' new chief likely will be one of the party's most visible faces in politics, making the role a far more influential post than it was during the Obama administration. Already, around a dozen Democrats' names have been publicly floated to succeed interim chairwoman Donna Brazile, who replaced Florida Rep. Debbie Wasserman Schultz in July after she was caught up in a hacking scandal. Minnesota Rep. Keith Ellison, a prominent progressive and the first Muslim elected to Congress, has emerged as an early contender, backed by much of the party's liberal wing. Ellison has also picked up support from several key Democratic leaders, including outgoing Senate Democratic leader Harry Reid and Reid's likely replacement, New York Sen. Chuck Schumer. Ellison was expected to officially announce his bid on Monday. His supporters argue that Ellison's faith would send an important signal about the party's commitment to inclusivity during the Trump administration. "My friend Keith Ellison is a terrific leader and a strong progressive who knows how to get things done. Now is the time for new thinking and a fresh start at the DNC. Now is the time for Keith," Reid said in a statement on Sunday. In interviews on Sunday talk shows, Ellison pushed back on concerns that he'd be unable to balance party responsibilities with the demands of his day job in Congress — a problem some Democrats believe hampered Wasserman Schultz. "There're a lot of places that I can serve," he said, in an interview on NBC's "Meet the Press." ''I'm looking for a place to be of use and benefit. And every single Democrat in this country better be thinking the exact same way." Ellison is far from the only contender for the job. Former Vermont Gov. 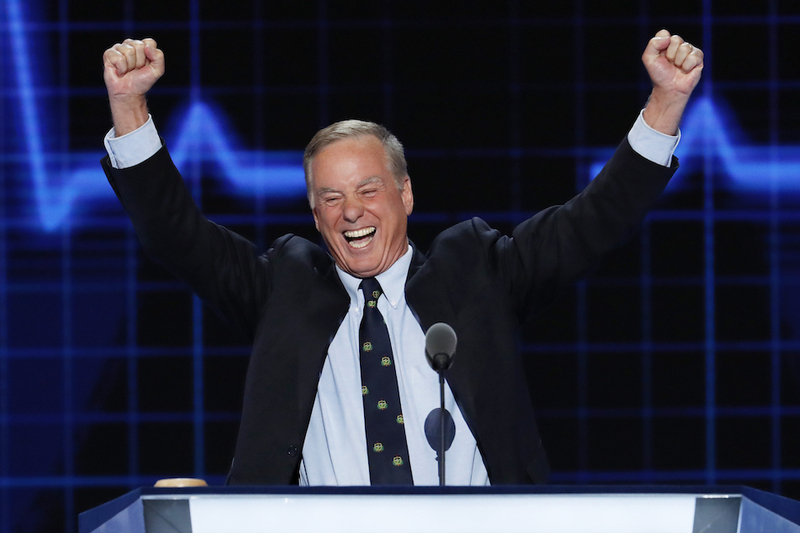 Howard Dean announced his intention Thursday to reclaim a post he held during the Bush administration. Those who support Dean point to his energy and success in building a grassroots movement that can mobilize votes. And because he is not in Congress he could be a full-time leader. Dean has argued for a 50-state strategy, saying that Democrats need to work across the nation, not just in the reliably blue cities and coastal states. Former Maryland governor Martin O'Malley, DNC National Finance Chairman Henry Muñoz III, and South Carolina Democratic Party Chairman Jaime Harrison have also said they're considering bids. Others are pushing for a Latino leader, arguing that the growing demographic group is crucial to the party's future and should be represented at the highest levels of its leadership. 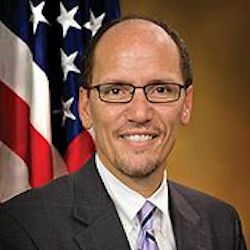 Outgoing Labor Secretary Thomas Perez, the former Department of Justice lawyer who led the civil rights investigations into the Portland Police Bureau and the Seattle Police Department, is on the list. Arizona Rep.Ruben Gallego and California Rep. Xavier Becerra are also said to be weighing a bid. Jason Kander, an Army veteran who lost the Senate race in Missouri to Roy Blunt on Tuesday, is also said to be considering a run. The contest comes at a time of deep unrest for the party — and the country. Anti-Trump protests continued this weekend with thousands of demonstrators turning out in cities across the country. And post-election polls showed a significant minority of Clinton backers question the legitimacy of Trump's win. Top party leaders are urging Democrats not to despair. "It's time to brush ourselves off, get back in the arena, and get ready to fight," President Barack Obama said in an email to supporters inviting them to join a call with him on Monday evening about moving forward.